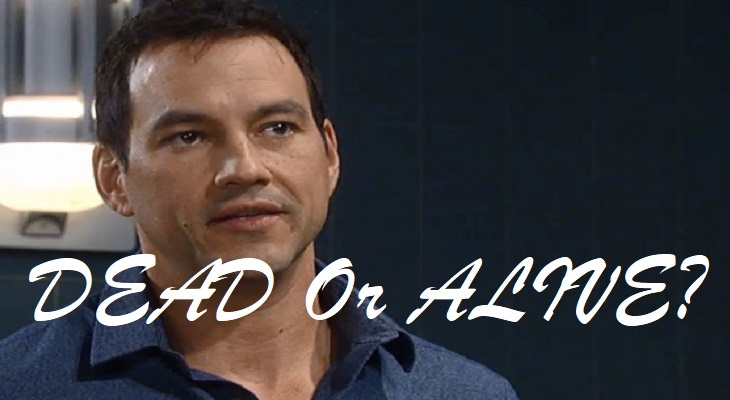 General Hospital spoilers have revealed much discussion over whether Nikolas Cassadine (most recently Nick Stabile) is really dead or if he faked his death, possibly with the help of his uncle Valentin Cassadine (James Patrick Stuart). There seem to be storyline hints that could support either scenario, we want to know what you, General Hospital fans think! Nikolas had tried to fake his death previously on General Hospital by creating a scene that looked like he had jumped or had been pushed out of a high window at Wyndemere to the cliffs below, after he and Jason Morgan (at that time Billy Miller) had gotten into some arguments about shares of ELQ. This was of course during the time when Drew Cain had been assumed to be Jason. Sam McCall, (Kelly Monaco) heard glass shattering and they both heard a loud thud, ran to the window and saw what appeared to be a bruised and bloody Nikolas on the cliffs. They ran down attempting to rescue him but by the time they got there, the body had been swept out to sea. It was never revealed how Nikolas pulled that off, it could be he had one of his servants break the window and create the loud thud and then hide in a secret passage, after Nikolas had made himself look dead. It’s possible with help from someone else who was never revealed either that he may have escaped in a boat hidden farther down the shoreline or even a submarine. A few days later General Hospital viewers saw him on an airplane seated next to Ava Jerome (Maura West) with a new identity and name, Niles Carradine! The only problem was Ava recognized him and let him know she did! They wound up on Cassadine Island where he was shot in the chest by Valentin and then fell off a balcony, again close to the shoreline! His body was never found this time, either, and all the others there, including Laura (Genie Francis) and Lulu (Emme Rylan) had to go on was Ava’s retelling of Nik being shot, presumably fatally, by Valentin and his falling off a balcony. There may be some holes in this second death story on General Hospital. For one, Valentin spoke to Nikolas in Greek, which no one else understood, prior to the supposed death of Nikolas. They may have been talking about how to fake Nik’s death, and then there’s Ava. General Hospital Spoilers – Who Is In On Death Hoax? If she really knew for sure Nik was dead, why did she think Patient Six in the Russian clinic, who turned out to be the real Jason Morgan (Steve Burton) might be him? Valentin has stated several times since that Nikolas’ body has never been found as well, implying that he may be alive! On the other hand, there are the sad conversations Spencer Cassadine has had recently with Britt Westbourne (Kelly Thibaud) and others on what would have been Nikolas’ birthday. General Hospital spoilers show Spencer has appeared to be truly missing and grieving for his father. Why would Nik and even Valentin cruelly let Spencer think his father is dead if he’s not? Spencer apparently was left out of his dad’s plans to fake his death the first time as well, when he tried to pass himself off as Niles Carradine. On the other hand, after arriving in Port Charles Valentin tried to take Spencer but was thwarted by Sonny Corinthos (Maurice Benard). Valentin could have been intending to take him to his father. Spencer continues to challenge Valentin for what Spencer feels is his rightful inheritance which doesn’t seem to make sense unless Nik is dead…or at least Spencer thinks he is. General Hospital Spoilers – Spencer Helping Nikolas? Maybe Nik felt Spencer couldn’t handle the secret and keep it that way! On the other hand, Spencer may indeed be in on a faked death charade with both Nik and Valentin, and the continued battle with Valentin may just be the over the top Spencer’s way of making it seem real. It’s still cruel to leave Laura and Lulu out of the loop thought. And then there’s the mysterious hand with the Cassadine ring seen with Cassandra Pierce (Jessica Tuck) several months ago who many fans think may belong to Nikolas. Is Nikolas Cassadine Dead or Alive? So do you think Nikolas Cassadine is dead or alive? Please cast a vote in our poll and tell us what you think!